This module takes the whole subscriptions feature to a completely new level. With this module a member can select and subscribe to any action of another specific member. For example if a member wants to track all new photos of another member but doesn't want to see notifications about comments or blog posts (or anything else!) this is easily accomplished with a few simple clicks. 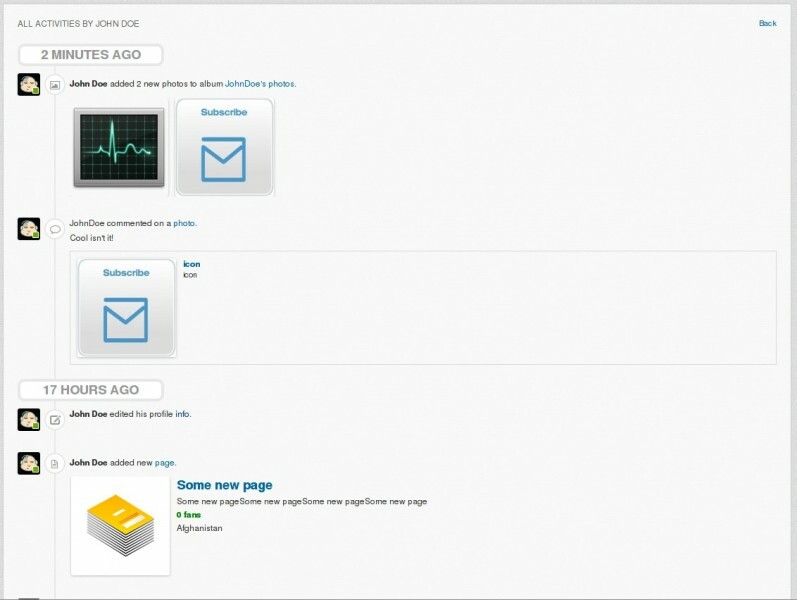 In addition the module offers a separate page for tracking the actions of all member subscriptions. This page lists all subscribed members/activities in a concise timeline-style format (see screenshots). On top of all this the module has the capability of sending hourly email notifications for all activities member is subscribed to. Please see detailed screenshots above that showcase some of these great new features. 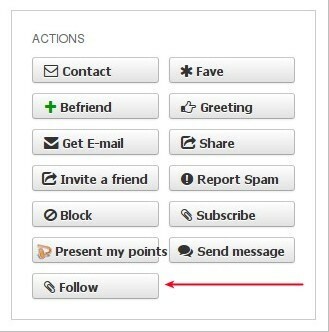 Adds "Follow" action button which can be used anywhere on the site where profile's thumb/icon appears. Allows a member to choose a different set of activities he wants to follow for each subscribed profile. Member can decide whether he wants to receive email notifications about activities of a particular profile he is following. Notification bar alert for number of new subscribed events. 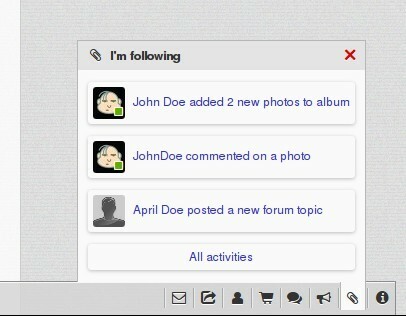 Shows the latest 10 notifications in a member menu popup box. Adds a profile page block showing Followers/Following stats for a particular profile. Adds a profile page block showing followers of a profile. Adds a profile page block showing all profiles the member is following. 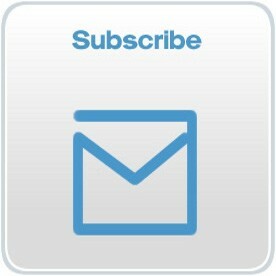 Provides a separate page for tracking/managing all subscriptions. Subscriptions page shows all new activities since last visit in bold, marks them as “seen” upon visiting the subscriptions page. 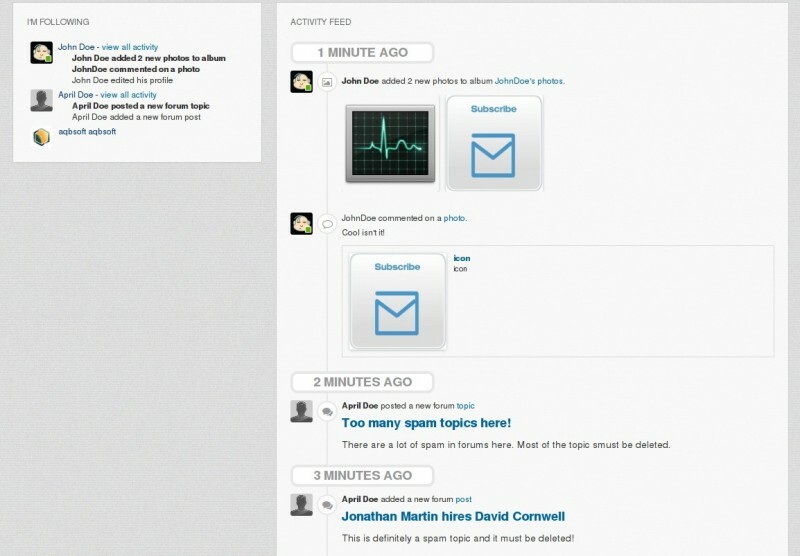 The list of subscriptions also shows three most recent activities for each profile. The list itself is sorted by most recent activity date/time. The module's homepage is shows the timeline of all subscribed actions. A member can view all activities for the last 72 hours (length of time configurable) of a of a subscribed profile on a separate page by clicking the "view all activity" link for a profile. A member can receive hourly notifications of subscribed profile activities for recent activities. Email notifications are cumulative, if a member selects email notifications for more than one member then a single email notification is sent containing updates of all profiles with recent activity. Automatically cleans up the database deleting entries older than 72 hours (length of time configurable). This is absolutely fantastic! It really ads user value.